Have you ever wondered how you can make your backyard more attractive to birds? According to the National Audubon Society, you can attract the largest variety of birds by offering the largest variety of seed. A crowd favorite is Black Oil Sunflower Seed and a few to avoid are oats, wheat, and milo. Planting native trees and bushes will create the ultimate backyard home for many birds, providing additional food and shelter. If you have wondered what attracts certain birds to your feeders and not others, there are a few factors you should consider. Here is a quick look at the feeding habits of four popular St. Louis birds to determine what you can do to make your yard more attractive. Since Cardinals don’t migrate, a good way to keep them around is to be sure your feeders are stocked through winter and they have plenty of fresh water and shelter. They prefer hanging out in shrubs but will frequent platform feeders with sunflower seeds or fruit such as apples and jelly. 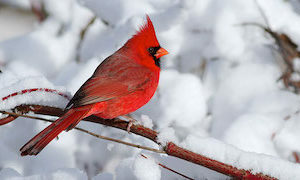 Cardinals are said to have the first song heard in the morning, so listen for them beginning in February. Fountains are great Blue Jay magnets as they like to be close to water for bathing and drinking. Blue Jays love acorns, so planting oak trees will ensure Blue Jays have a preferred snack when the feeders are low. As for the feeders, installing one on a post is a better option for Blue Jays and they like peanuts and sunflower seeds. Blue Jays can be bullies when it comes to staking their claim on feeders and bird baths, so don’t be surprised if they appear to take over. Robins are ground foragers, feeding on insects, worms, fruit, and berries. They will eat from a platform feeder and prefer hulled sunflower seeds as well as suet. If you want to make your yard especially attractive to Robins, plant winter-bearing berry trees like Hawthorne and Dogwood. Now that you have learned how to become a St. Louis bird feeding expert, grab some seed and join the National Audubon Society’s Great Backyard Bird Count February 16-19. The National Audubon Society has been partnering with the Cornell Lab of Ornithology for twenty years on this four-day project of real-time wild bird data collection. If you would like to participate, log your location on their website and keep track of the birds you see for at least 15 minutes on one or more days.